Drug Addiction: Does Your Environment Make it Harder to get Sober? What is an Environmental Cue? An environmental cue, or trigger, can be anything that brings back thoughts, feelings or memories that are associated with addiction. Any person, place, or thing that is associated with using drugs or alcohol can be a trigger. Seeing these environmental cues, or triggers, creates an immediate response to the “reward” which used to be the drug used. Essentially, seeing a trigger will cause your brain to react with an intense craving, or process the memory of you using a drug. Examples of environmental cues could be a street where you used to buy drugs, seeing a needle, passing by a house you used to use at, seeing an old friend who you used to use drugs with, etc. What Do Environmental Cues Do? Environmental cues trigger the brain’s emotional and stimulus-response systems in addition to activating the area of the brain where memories are processed. Environmental cues can be strong triggers for those trying to overcome their alcohol or substance use disorders. Addiction is a chronic and progressive disorder, causing complex reactions for addicts when they are triggered. These triggers can cause addicts to relapse, because of the quick associations their brains make to using the drug. It’s been shown that triggers bring back drug seeking behaviors, which are dangerous for recovering addicts, as addiction treatment seeks to change behaviors and lifestyles. Research shows that triggers will cause levels of drug seeking behaviors to bounce back, showing an addict in a state before therapeutic work when in fact they may have just undergone months of addiction treatment. So, does your environment make it harder to get sober? A study conducted by the University of Guelph reports that there is more going on in the brain when an addict encounters an environmental cue, like passing a street they used to buy drugs off of or seeing drug paraphernalia. The associations made in the brain trigger memory processing systems that make it harder to counter addiction. “As soon as a cue (or trigger) is presented… humans who have been exposed to drugs for an extended period of time, will go right back to the activity that used to bring them drugs even after months of being without it” (Jaffe). The cognitive associations made with particular places, people, or objects make it harder to treat a drug or alcohol addiction. Many times, even withdrawal-like symptoms will surface from an environmental cue, called Post-Acute Withdrawal Symptoms or PAWS. These are symptoms that can come and go within the first year of recovery. Although signs and symptoms of a craving can hit without an environmental cue, these environmental triggers make cravings even more intense. Part of addiction treatment is re-writing what your life looks like, which can be hard if you are going back to an environment with many people, places, and things that carry negative associations. Negative associations and triggers make the recovery process much harder, and each guest must be aware of what triggers them in order to prevent relapse by avoiding those triggers. Despite the ability to change many environmental cues, our treatment programs use many behavioral therapies to change the way you think about certain triggers, helping to counter your cognitive associations. The only way to break a trigger-response system is repeated exposure to a trigger without the reward. This is why it is important to know your triggers, so that you can discuss them with your therapist and case manager, as to challenge these triggers in a safe environment like in an addiction treatment facility. Environmental cues may never go away, but we can safely expose ourselves to triggers without relapsing. This takes intensive therapies and therapeutic methods of recovery. 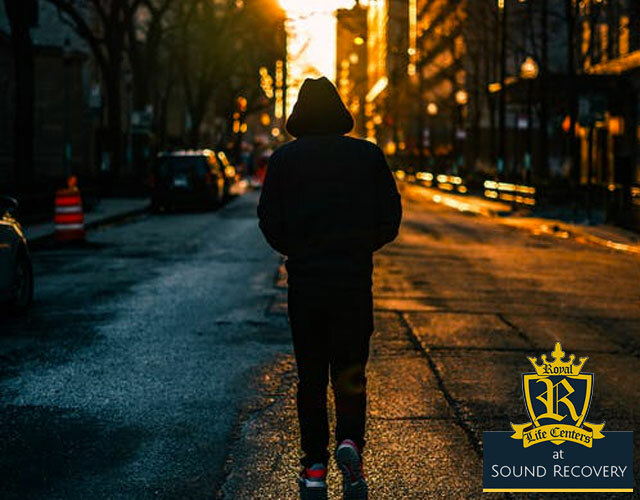 Royal Life Centers at Sound Recovery uses intensive therapy to uncover the root cause of your alcohol or substance use disorder, identify triggers, and provide you with skills that will help you rebuild your life. We use individual therapy sessions, group therapy, adventure therapy, activity therapy, and equine therapy. Our guests are given a primary therapist and a case manager, once they arrive to our treatment facilities. Royal Life Centers at Sound Recovery offers full outpatient programming, with programs that include: a partial hospitalization program (PHP), an intensive outpatient program (IOP), an outpatient program (OP), sober living and graduate housing. Our treatment programs were designed to follow guests through the stages of recovery. Royal Life Centers also offers treatment programs including medical detox and our residential inpatient program. Our goal is to provide guests with the skills and tools they need to rebuild happy, healthy, and successful lives in sobriety. Our treatment options can be either short term or long term, but all programs support a lasting sobriety. Our programs give guests access to medical professionals for management of any mental health disorders they may have in addition to an alcohol or substance use disorder. Guests are also introduced to 12-step programs of recovery for the goal of staying sober, and having a sober support network outside of a treatment setting. We also provide services for family members of our guests, Because We Care. For a treatment center near you, please click here for a list of all of our locations. Crane, Marisa. “Post-Acute-Withdrawal Syndrome (PAWS): An In-Depth Guide.” American Addiction Centers, American Addiction Centers, americanaddictioncenters.org/withdrawal-timelines-treatments/post-acute-withdrawal-syndrome. Jaffe, Adi. “Triggers and Relapse, a Craving Connection for Addicts.” Psychology Today, Sussex Publishers, 17 Mar. 2010, www.psychologytoday.com/us/blog/all-about-addiction/201003/triggers-and-relapse-craving-connection-addicts. University of Guelph. “Why environmental cues make drug addiction extra hard to beat.” ScienceDaily. ScienceDaily, 27 February 2019. . If you or someone you know is struggling with an addiction, please don’t hesitate to reach out to our team of addiction specialists, toll free at (877)-RECOVERY or (877)-732-6837. Our team is available to take your call 24 hours a day, 7 days a week. Because We Care.